Bedtime is simultaneously one of the best and worst times of the day. As parents, we are looking forward to getting our kids in bed and having a break. The kids are tired and cranky and most likely looking for ways to delay bedtime. We are also tired and less patient. How can we make this process as easy as possible? You want to have a Consistent Bedtime, yes. You should also have a bedtime “start time.” This is the time you start the process of getting ready for bed. The time you start this will depend on what you have in your bedtime routine and how long it all takes to get done. Give yourselves enough time that you can move through the routine comfortably without having to lose your cool in order to herd the cats–I mean, kids–along toward bed. Much of the time, our impatience as parents comes from us wanting our kids to move faster. If we give ourselves enough time, bedtime can go at a comfortable pace without having to be impatient. Have a set routine in place for getting ready for bed. You can even have a set order–not just a “do these things” but a “do these things in this order” routine. This way, your children can do things more independently and with fewer reminders. If your children struggle to remember what to do and/or in what order, make a chore chart list, a chore card pack, or something similar that they can consult for help in knowing what to do. Ideas to include in the routine are: go to the bathroom, get pajamas on, brush teeth, clean up messes from the day, read scriptures, read story, say prayers. See Bedtime Routine: Storytime for some more on our routine. No matter what it is, things can be easier when parenting if your child can be independent at it. This is when the chore charts I mentioned above can come in handy. Another aspect to your child being independent is that he has to be shown how to do things and you have to be patient while he learns. A painful process to observe is that of a child learning to put on his own clothes. It takes a long time and you just want to jump in there and do it for them. Take this into account with your start time. Have enough time that your child can do the things independently that he can do. As he practices, he will get faster. Sometimes it helps to stagger bedtimes. There may be things you want to do as an entire family (for example, we do family scripture study and prayer), so you can do those things together and then put some kids to bed earlier than others. You can have older children quietly sit on the couch and look at books while you put younger siblings to bed. It makes it easier to start to reduce the number of children you are working with at bedtime. If you have older children, have them help the younger children with bedtime tasks. Brayden and Kaitlyn often read a bedtime story to McKenna at night, especially if one of us is gone at bedtime. You can put an older child in charge of inspecting teeth, of helping with clean-up, with reading stories, etc. If my children are taking longer than usual to get ready for bed, I try to make it fun by having a “Can you get the room cleaned in five minutes” thing. Sometimes it is a “If this isn’t clean in five minutes I am coming down with the bag and anything not put where it goes is going in my bag game” (fun for me, not them). Beating the clock is always a nice challenge that gets kids thinking more about being fast and less about delay tactics. You can also offer incentives. We often save fun activities we have planned that are indoor for after the kids are in their PJs and all ready for bed. So if we want to play a family game or watch a show as a family, we have the kids go through the routine before the activity. They are always very fast workers when they are trying to get done with enough time for the activity to take place. Once your child is capable of handling the freedom, allow your child to read for a few minutes before lights are out. This will get your child reading more independently, and it will also give your child something to look forward to once in bed. If your child can tell time, tell him the time to turn lights off and go to sleep. If not, you can go tell your child when it is time to turn lights out. I personally prefer to not allow the freedom until the child can tell time. 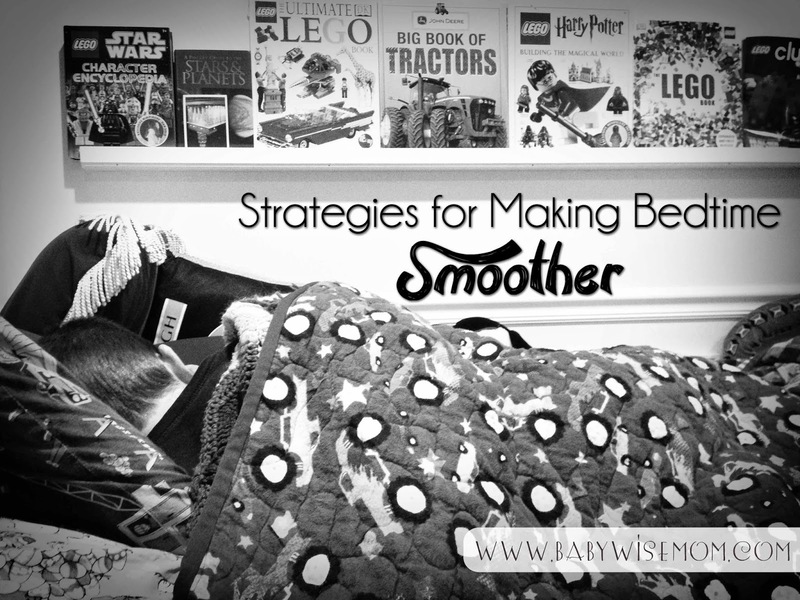 What do you do that makes bedtime smoother at your house? Val,I am so in need of your help. This is probably not the category to put this under, but I wanted to make sure you got my message. My 13 month old has turned in to a mess. He is screaming all the time. He screams when he is frustrated, when he doesn't get his way, and sometimes gets upset if I put him down. What is happening? I am trying so hard to teach him sign language and to really push IP time when he gets home from daycare. I am starting off sitting in there with him until he can handle it by himself. It seems to be a constant screaming fest. He seems all over the place. I need to know a consistent discipline plan and how to remedy this situation. Thank you. Is it sudden? If so, I would say it might be teething. That can really cause some discipline issues. I would give him some pain killer and see if he gets better. If so, you know that is it. Have a plan for what you will do when he has a fit and stick to it. If you look at the blog index, then click on discipline. Then scroll to toddlers and you will see lots of ideas. Thanks for the great bedtime advice. Bedtime has always been smooth for my 22-month-old, thanks to babywise and reading your posts – consistent time, milk, story, song and she sleeps on her own.However, after the arrival of a sibling, she now insist we stay in the room until she sleeps. It didn't start straight away, only after he turned one month.If we leave the room before she sleeps, she stands up in the cot and calls for us and she can persist for more than an hour. We tried this "CIO" for a few days but the calling got longer! And she would sob and sing our bedtime song (heartache)…Any advice? Should I stay with her longer until she is more used to her new sibling before changing back to the old routine where we leave after 1-2 songs? Or should we rectify the problem now?Thanks! I would not stay with her until she was asleep. I would spend some good one on one time with her during the day and have a nice bedtime routine. Have her help the baby during the day. Show her how they are the same and help her love the baby. I wouldn't stay with her at night because that will cause a new habit she will not want to let go of. Thanks for the bedtime ideas. I absolutely love your blog. Been following for almost 4 yrs. I have three kids and each one has been a BW dream baby!! I love the idea of letting the older children read alone. I think I'll start that.